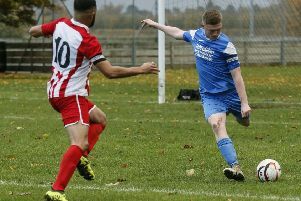 Leighton Town enjoyed a double slice of good news at the weekend when they picked up a 1-0 win over Leverstock Green, and were reinstated into the FA Vase. Aaron McKee scored the only goal of the game in the first half against Leverstock to see Town move up to 12th in SSML Premier Division. Despite losing to Cogenhoe 2-0 in the Vase earlier this month, the Cooks fielded an ineligible player, and have been thrown out of the competition. It means Leighton are back in action this Saturday when they take on Lye Town in the third round at the Sports Ground. Town made a bright start at Pancake Lane on Saturday, twice having come close to scoring before McKee’s goal on 20 minutes put them ahead. Settling down with their lead, Leighton only threatened Leverstock’s goal once more in the opening period when Lewis McBride was denied from long range. The second half lacked the same liveliness of the first. While Leverstock had more of the possession and territory, Leighton keeper Charlie Jones barely had a save to make as the visitors saw the game out, claiming the important three points. On Tuesday night, Town are back in League Challenge Cup action when they take on Tring Athletic for a spot in the semi finals. Fans keen to travel to the West Midlands for the FA Vase clash with Lye Town can book their spot on the Leighton Town coach by calling 07486 605268 or by visiting Bell Close on Thursday from 7.30pm-9pm.